Australian investigators have released the final pictures taken on board a seaplane which plunged into a river last year, killing six people. 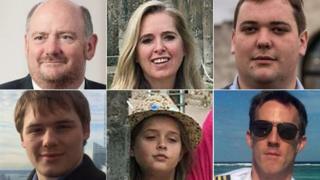 Five members of a British family and a Canadian pilot died in the incident north of Sydney on 31 December. Authorities are yet to release their findings on what caused the crash. But in an interim report released on Thursday, investigators said photos and witness accounts had helped them to reconstruct the flight's final moments. 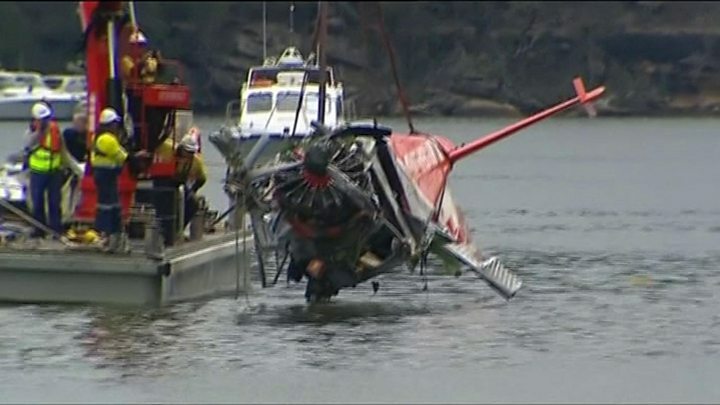 The DHC-2 Beaver was on a sightseeing flight when it nose-dived into the Hawkesbury River at Jerusalem Bay, about 50km (30 miles) from the city centre. Businessman Richard Cousins, 58, died alongside his 48-year-old fiancée, magazine editor Emma Bowden, her 11-year-old daughter Heather and his sons, Edward, 23, and William, 25, and pilot Gareth Morgan, 44. Most of the wreckage was recovered by Australian authorities in January. On Wednesday, the Australian Transport Safety Bureau (ATSB) released photos that had been recovered from a camera and a phone on board. Investigators were able to use images taken by the front seat passenger to recreate the flight path, the ATSB said. This was corroborated by the accounts and photos of a witness on the ground. ATSB director Nat Nagy said the evidence had allowed investigators "to determine what happened in the lead-up to this accident". The photos had also helped investigators to establish the seating positions of those on board, the report said. Earlier this year, the ATSB said the plane had made a steep right turn before entering the water. Flight operator Sydney Seaplanes described the action as "totally inexplicable". Investigators said they would further examine Mr Morgan's health and medical history, but he had appeared fine in the days before the crash. He had more than 10,000 hours of flying experience, including about 9,000 hours on floatplanes. There was no voice or flight data recorder on board. Neither were required by regulations for an aircraft of such size, officials have said. The ATSB will release its final findings and recommendations sometime in the next six months.